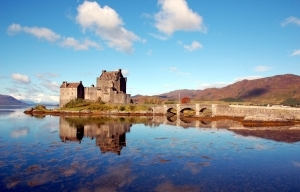 Among various Scottish castles, the Eilean Donan fortress still keeps the title of the most romantic and frequently photographed site. Every year this incredibly beautiful view is photographed by thousands of tourists from all over the world. This fortress enjoys great popularity due to two factors. First, an extremely picturesque location on the west side of mountainous Scottish region, a place where three lakes meet, Loch Long, Loch Duich and Loch Alsh. 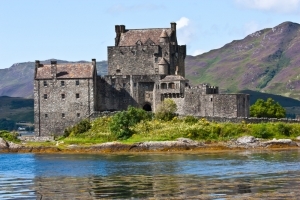 Secondly, castle’s caring owners from Clan McRae who at the beginning of the 20th century literally rebuilt the Eilean Donan ruins after nearly two hundred years of oblivion. 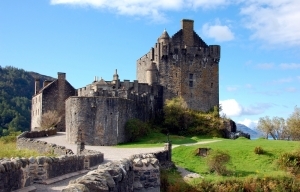 Located in the surroundings of picturesque landscapes, over time the rebuilt fortress became Scotland’s cult icon appearing in many films. The defensive structure had existed already in ancient times on the rocky island of volcanic origin, washed by the water from Lake Loch Duich. By the end of the 6th century a monastery was erected on the island. St Donan lived there with his brothers. He was a Christian preacher whose name finally stuck to the island and became an inherent name of the castle. In 618 the monastery built at the border between the lands of the Picts and Scotti was destroyed and all its residents were killed. Some historians attribute those crimes to travelling looters, while others believe that the order to burn the monastery was given by the Queen of the Picts who did not like Christians much and was suspicious of Donan himself who came from the Scotti tribe. 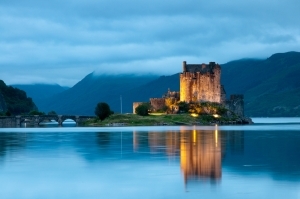 The Eilean Donan Castle was open to public in 1955, then this romantic site gained fame and huge popularity very quickly. By the end of the 20th century the fortress appeared many times on the screen as a natural setting in different films. The most popular ones include «Highlander» and one film from the «James Bond series», «The World Is Not Enough». 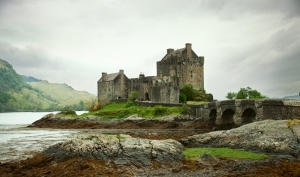 The picturesque surroundings and the location of the castle on an island make Eilean Donan attractive in every season. As for the people who are sensitive to the beauty of nature, this castle gives an opportunity to organise wedding ceremonies, family celebrations or spend some free time on your own. The ruins of the old castle, which existed several hundred years ago, remained on the lower shore of the island, outside the line of today's defensive walls. The main tower, as befits a keep, has massive walls which are 4 metres thick. It houses several displays. The first floor presents a collection of weapons, a painting gallery as well as quite a large collection of old furniture and porcelain. On the second floor is a heraldic exhibition presenting the flags and shields of Clan McRae, as well as war trophies the clan gained during the battles. You can also see here how large and branched the family tree of the House of McRae is. On the third floor of the tower, where visitors climb up steep and winding steps, are six bedrooms renovated in 1996. Each of them has its own decorations and an individual name related to the history of the castle and its surroundings. There is an entrance to the defensive wall in one of them where you can enjoy wonderful views of Lake Loch Duich and nearby hills. After admiring the picturesque panorama, you can go down to kitchen facilities where high figures presenting servants and the former landlady of this castle, Elly MacRae-Gilstrap, stand. They look exactly as if these people froze while preparing dinner. February - March - from 10:00 a.m. to 5:00 p.m.
April - October - from 10:00 a.m. to 6:00 p.m.
November - December - from 10:00 a.m. to 4:00 p.m.